The Village at Sailing Hawks has beautiful views overlooking the Mesquite bay and across the lake to the Mesquite Bay state park, Federal Wild life reserve, nature trails and the fishing piers. 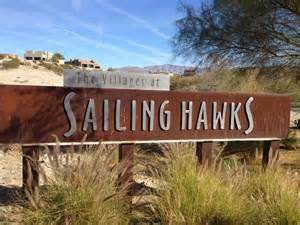 Located on 56 acres there are several villages within the Sailing Hawks community. The Ridge Townhomes are located in in a gated community and built on an angle to portray a unique modern style. The garages are built underneath to accommodate the RV’s, boats and recreational vehicles with underground utilities. The Terrace includes beautiful lake view homes and abundant square footage. Some of the homes amenities include concrete flooring, kitchen islands, gazebos and covered patios. Mesquite Bay has some oversized lots with views. As part of the Sailing Hawks neighborhood, all of the village are incorporated together to artfully transition from one village to the next. Across from Mesquite Bay you can enjoy the lighted walking paths, fishing docks and swimming area. The Village is in close proximity to many of our recreational golf courses, visit one of our Casino’s or you can enjoy the outdoors swimming, boating, jet skiing, fishing, hiking, bird watching and much more.